The brutally-cold temperatures outside are making apartment life miserable, according to renters in Chicago who said their landlords are not responding to their heating concerns. Francier Baldwin told NBC 5 Investigates the heat circulation in her south side apartment is spotty. "It's not coming on enough," Baldwin said. "It don't stay on long enough." Baldwin said she is attempting to keep warm by dressing in layers and sleeping under lots of blankets. She is also using her stove and oven to produce heat. Fire officials warn against using ovens for warmth due to potential fire hazards. However, Baldwin said she is left with no choice. Baldwin's property management company could not be reached for comment. Tenants are urged to contact the city regarding heating complaints by calling 311. The Chicago Department of Buildings has received 254 heat complaints during this extreme weather period. Eighteen complaints have resulted in enforcement action. 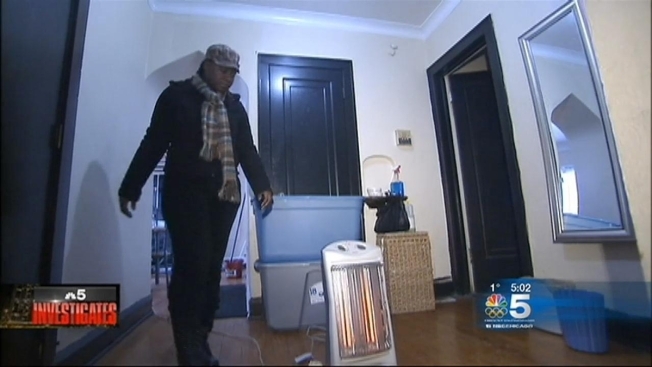 Shevada Thompson is a renter in Englewood who said she has been without heat since Christmas. Thompson is using space heaters to stay warm and claims her property management company is ignoring her phone calls. "They haven't done anything about the heat," Thompson said. Thompson's landlord disputes her claims. However, the city conducted a subsequent inspection of the building after an NBC 5 Investigates inquiry. A city spokesperson said the inspection verified that there is "inadequate heat" in the building. The city filed an emergency motion and the owner is due in court Wednesday. Meantime, both Thompson and Baldwin contacted the Metropolitan Tenants Organization. The tenants' rights group claims it has received double the calls from renters in the past two months compared to the two coldest months last winter. "If tenants are paying their rent, they're paying their rent for a unit they can live in," said the MTO's Noah Moskowitz. "Landlords expect full rent. Fine. Make sure the unit is a habitable place." Renters can send a certified request to a property manager demanding their heating issues be addressed. City law allows for a rent reduction if a landlord does not respond to the certified request within 24 hours. MTO said it is also hearing about an increase in landlords who use timers for heat. For example, Moskowitz said a landlord may heat a unit for eight hours during the day and turn off the heat at night. He said that could make it difficult for a city inspector to take action.